The Washington NFL team wants you to think there's a grass-roots movement in support of its offensive nickname. Is there really? Who’s Behind the New Washington Football Team Website? The team wants you to think there’s a grass-roots movement in support of its offensive nickname. The site’s source code suggests otherwise. 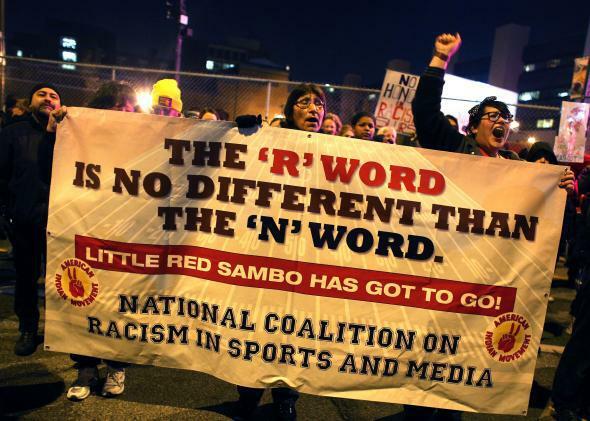 A 2013 protest of the Washington NFL team’s nickname. You may have noticed ads on the Washington Post and Sports Illustrated websites for a new site that wants to set the record straight on the Washington NFL team’s offensive nickname. That site, which was registered on June 30, touts the nickname’s storied history, various polls that reflect its popularity, and claims that it’s really, truly not offensive to Native Americans. Who is behind this site, which has a stated mission to present “historical evidence to fair-minded opinion leaders on both sides of the issue so ongoing discussions can be constructive”? The About Us page indicates that it is “a growing online community of passionate Washington [NFL team] fans and others who support the team’s use of its name and logo.” A Washington team spokesman told the local ABC affiliate WJLA that “they know of the site and totally support their effort,” sounding surprised and delighted by this online campaign. While that statement is not dripping with clarity, we do know that Washington owner Daniel Snyder has in the past enlisted mouthpiece-for-hire Lanny Davis to stump for the team’s nickname. This new, probably-not-grass-roots website also appears to be part of a PR operation. This one bears the fingerprints of Burson-Marsteller, a communications firm best known for its crisis management services. Burson-Marsteller has done PR work for, among many others, the manufacturer of the Three Mile Island plant, Johnson & Johnson (in the wake of early-1980s Tylenol poisonings), and military contractor Blackwater USA. The firm’s crisis management page also notes “The Lady Gaga Concert Debacle” as a representative case study. Though Burson-Marsteller has not publicly declared that it has any connection to the nickname-defending website, Jamie Zoch of Dot Weekly noted that the firm has hand-registered several sites with very similar names in recent days. (The registrant name for the nickname-defending site itself is listed as “PERFECT PRIVACY, LLC.” Perfect Privacy is a service that allows you to buy a Web domain without releasing any of your personal information.) A Google site search of the nickname website also reveals a login page that is “Powered by Burson Site Factory.” And a search of the site’s source code reveals a link to http://www.burson.acsitefactory.com. That Burson page shares an IP address (54.235.214.41) with the nickname website. What is Burson Site Factory? Another Google site search, this time of http://www.burson.acsitefactory.com, reveals the existence of http://crisispreview.burson.acsitefactory.com/, which appears to be a template for a generic crisis management website. That template, like the nickname site, was built using the content management system Drupal. The source code for both sites reveals that they share a Drupal theme, something called “acq_crisisoncarbon,” as well as large chunks of code. How do the two sites compare visually? When asked about Burson-Marsteller’s involvement with the website, Washington NFL team spokesman Tony Wyllie said he would get back to us; he had not done so by the time we published this story. Burson-Marsteller has also yet to respond to inquiries about its connection to the site. We will update this post if/when the team and the PR firm respond.